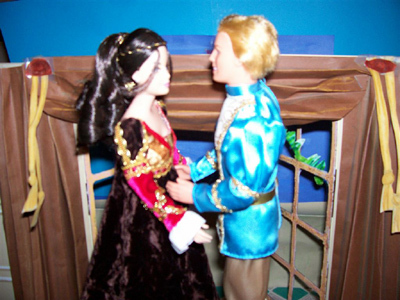 Some time last year, Jayn chose a very pretty collectible Barbie from the Mattel factory store, the Juliet ballerina depicting the ballet of “Romeo and Juliet.” She is a very pretty doll, finely detailed, delicately made up, and one of the rare en pointe foot sculpts. Clearly she is dressed in her nightgown, and the box depicts her posed before the French doors leading to her balcony. 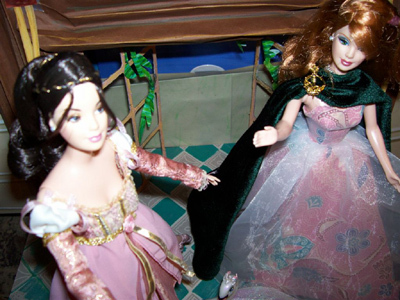 The very beautiful box art was one of the first inspirations leading Jayn into the world of creating backgrounds for her dolls to be posed and photographed in. She asked for my assistance in recreating the scene, and the faults of scale in the finished work are entirely mine in this, my first attempt. Meanwhile the box blurb was an introduction to the story, and Jayn was immediately interested. 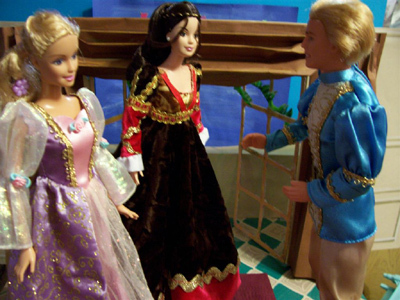 Over and over she would request the story of “Romeo and Juliet”. She was very interested in the fact that it had been a play, and then a ballet. We read a bit of the play, but that was less interesting than hearing me retell the story. We watched a bit of the Norma Shearer movie version, although Jayn’s appreciation of black and white movies is yet to emerge. What really excited her was “Shakespeare in Love”. 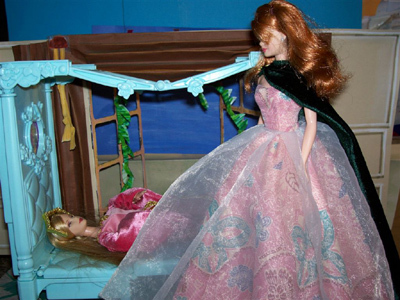 She had me play their portrayal of the death scene over and over, and was also very interested in the Queen. 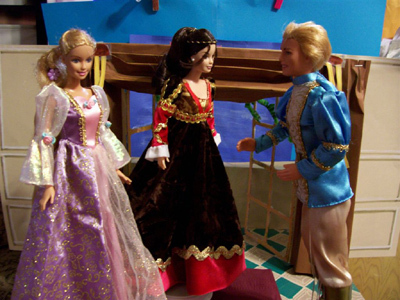 Jayn often notices references to “R & J” in other movies, particularly balcony scenes – she calls it “making a joke on Romeo and Juliet”. 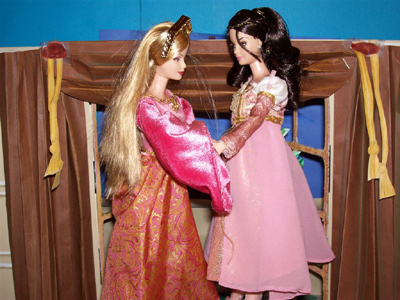 She also had a sticker book with a representation of another Juliet Barbie doll (non-ballet), so she had me make a rendition for a dancer of the same costume (see the photos). We got to see the real thing at the convention, and make a comparison. One of the other unschoolers here organizes a monthly fun event, the Super Duper Show and Tell Club with very loose themes each month. One month the topic was Countries of the World. Although some parents took it as an opportunity to display their kid’s unit study prowess, complete with quizzing and prompting, there were also a few of us who stepped back and allowed our kids to do their own show and tell presentation. Jayn chose Italy, which allowed me to order pizza for the pot luck. 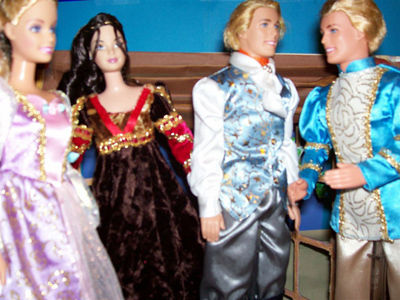 Jayn brought along two Barbie’s. 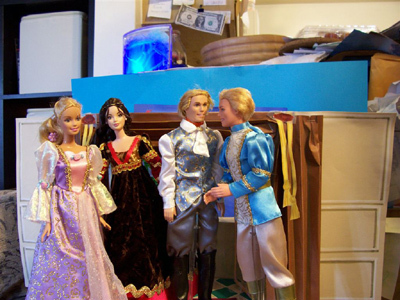 The first was Juliet, and she told the entire story of Romeo and Juliet from memory to a group of enthralled kids, who were of course drawn to the dolls. 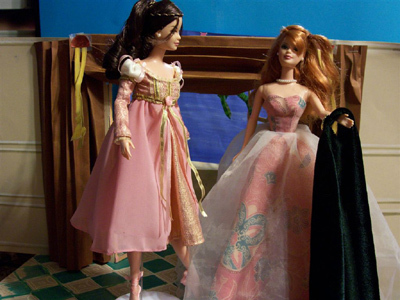 The second was a special Barbie and accompanying book, about Barbie the museum curator’s trip to Venice, “The Three Teardrops”. This doll is dressed in Restoration garb. Again Jayn told the whole story, turning pages of the book to show the pictures, and mentioning her father’s trip to Venice a couple of years ago. 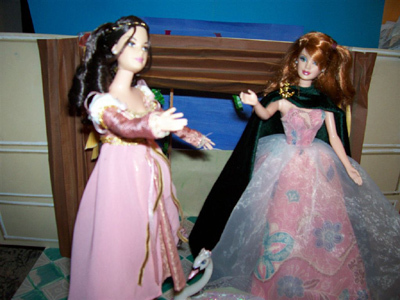 Since Jayn was so in love with her Juliet doll, Santa brought her the Titania ballerina doll from a “Midsummer Night’s Dream”. Now here is a story that Jayn is pretty familiar with, since there is a Mickey/Minnie/ Donald/Daisy version with Goofy as a klutzy Puck. (Mickey and Minnie star in accessible animated versions of several classics including “A Christmas Carol”, “Around the World in 80 Days” and “The Nutcracker”.) Titania will be starring in a series of photos to be taken at the gorgeous Huntington Gardens soon. One of the things that gives me the warm and fuzzies is that when Jayn eventually does approach the reading of Shakespeare and the theatrical productions, she will already have a rich appreciation of the stories and characters and references in popular culture of his writings. 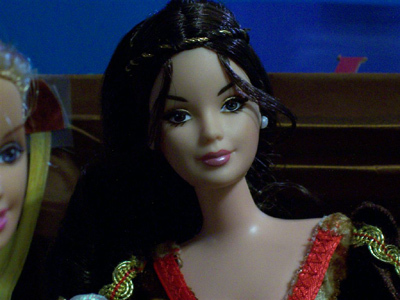 Just today, while swimming in the pool, we were talking about Cleopatra and her beauty – a modification of a Disney Princess doll (same size as Barbies) that we are undertaking – and I mentioned that Shakespeare has a description of her in his play. Jayn won’t be taken by surprise as I was at learning how many of those little phrases that are just part of the English speaking world are from the Bard. In creating her photo spread, Jayn decided to change some of the story to make it a bit more cheerful. 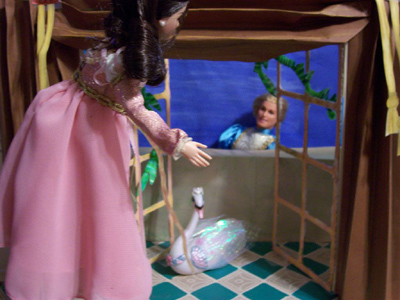 Juliet is depicted, after shooing Romeo from the balcony, learning that Nurse is apparently not well, but the family resolves to take care of her. We need more backgrounds to complete the story, but have been distracted by others. Meanwhile I am currently remaking an interior to proper scale.